Centre-back Gaby Zakuani is a fan of Posh manager Dave Robertson. 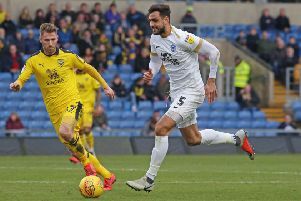 Star defender Gaby Zakuani believes manager Dave Robertson should be given the chance to build his own Peterborough United squad. Robertson’s chances of landing the job on a permanent basis have been damaged by a run of six League One matches without a win. Posh are now 12th in the League One table heading into the final two matches of the season. But Zakuani, one of the players who has flourished since Robertson replaced Darren Ferguson in February following an embarrassing 3-0 defeat at MK Dons, is still firmly in the current manager’s camp. “To be fair to Dave this is not his team,” Zakuani stated. “He inherited a squad from someone else and immediately prompted an improvement in results. “It was important someone came in to steady the ship and initially he did more than that. “We even flirted with the play-offs for a while and no-one saw that coming after we’d lost 3-0 to MK Dons, our biggest rivals in the division. “The players are all backing Dave. He helped us dig out some results and now he’s helping us to try play more entertaining football. “The results have tailed off a bit, but we’ve at least shown some passion and commitment and that has been passed down from the manager. “Players have improved under him as well. “I’ve enjoyed my football and the day-to-day training more since he took over and look how good Ricardo Santos looks now. “He has all the attributes needed to become a top central defender and the current coaching staff have brought the best out of him. “Maybe the smart move would be to ask the opinion of the senior players, but at the end of the day it’s obviously the chairman’s decision as it’s his club and his money. Chairman Darragh MacAntony is due to interview candidates for the manager’s job when he returns to the UK in May.